Memberships can be bought through PayPal using the Buy Now buttons below. Payment will be processed and you will receive a confirmation from PayPal immediately. 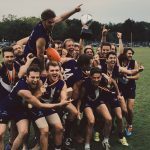 If you require or would like further confirmation from the Hamburg Dockers Australian Football Club, please reach out through internal messaging groups or the Contact Information found on this site. Membership payment can also be done through direct money transfer. Please leave your full name under the transaction reason (Verwendungszweck). If you have any questions, queries or concerns, please contact us at info@hamburg-dockers.de and we will get back to you as soon as possible.